Back in the 1970’s my parents took me on holiday to the fishing port of Brixham in South Devon. Here, during one of my numerous shoreline investigations, I happened onto some local fisherman loading up crabs for export to Spain. Although very familiar with the ubiquitous Brown or Edible crabs that inhabit our own East Anglian coastline, I’d not prepared myself for the other denizen of the those particular seas- the European Spiny Spider Crab (Maja Squinado). I had seen them before on a trip to Brittany, in a homarium, outside a restaurant in Dinard (Les Araignee), but they were not, as I remember the size or stature of these creatures being loaded into transport tanks. One, very obviously expiring specimen, had been left on the beach and of course with huge enthusiasm I attempted to revive it in a nearby rock pool, not realising that water left by the falling tide was nigh-on anaerobic. Needless to say, we didn’t enjoy it for dinner that night! 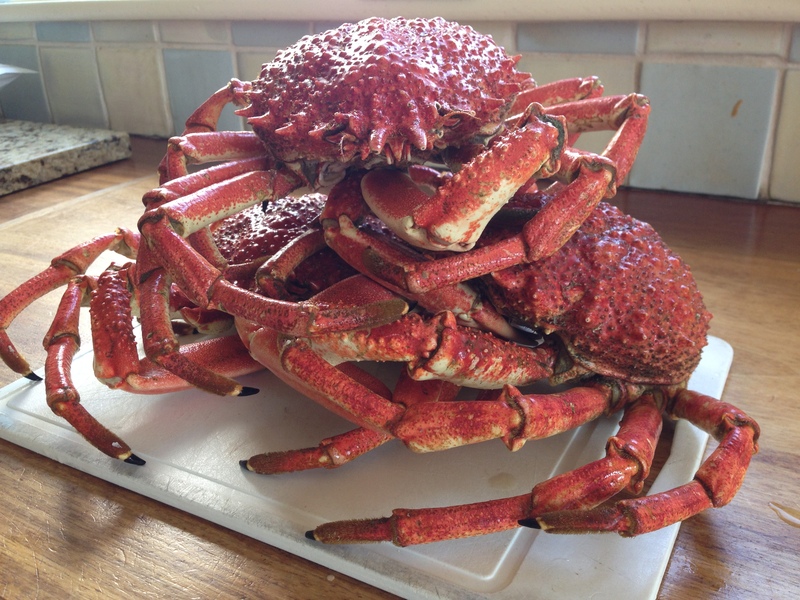 More recently though, I have enjoyed Spider Crab and I now get them sent up from the West Country direct or ” d’rec” from the fabulously committed inshore fisherman of the Dreckly Fish crew based in Newlyn Harbour. Spiders Crabs there are caught using conventional low-impact potting methods and are most commonly taken inshore, during the early summer, when they move to shallower water.They come to me via our supremely knowledgeable and passionate local fish guru, Chris, of Maximus Sustainable Fishing. They are shipped live or cooked, packed in ice and seaweed and I can honestly say that despite, for some folk, their off-putting appearance, their flesh is so incredibly sweet, delicate and flavoursome. 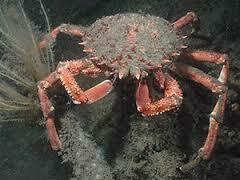 Relatively easy to pick, both the claws and internal “honeycomb” yield surprising quantities of meat. Last week some of our more “foodie” friends came for supper and I prepared a starter of picked Spider Crab for them as a surprise. Like all seafood, I think the key to retaining the flavour is prepare it simply with minimal extra ingredients and so in this instance I made a cocktail of crabmeat and avocado with homemade lemon mayonnaise and a dusting of Cayenne. Delicious and well received by the Spider virgins. I can fully understand why, as a nation, we don’t embrace shellfish such as the Spider into part of our culinary psyche, but I do think we are missing a trick with these wonderful creatures. And as Chris says- once you’ve picked clean the outer shell (carapace) you’ve got a free bowl! Very interesting reading keep up the good work Mike. Thanks Kevin. It’s early days but I’ve got a lot of good stuff to write about. Thanks for looking and commenting!